The oil well is in Maysan province, east of Amara, near the Iranian border, officials say. 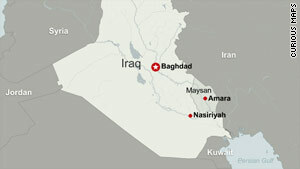 Iran denies Incident happened; Iraqi government blames Iranian "armed group"
Baghdad, Iraq (CNN) -- The Iraqi government Friday demanded the withdrawal of an Iranian "armed group" that it says seized an oil well in southern Iraq on Thursday night. Iran is denying any takeover took place. The Iraqi government issued a strong statement deploring the act after Iraqi Prime Minister Nuri al-Maliki headed an emergency meeting of Iraq's National Security Council to discuss the situation. "The council stressed that such incidents would be considered a violation of the border and violated Iraq's sovereignty and its territories and calls upon Iran to pull out the group from well No. 4 and take down the Iranian flag from the tower of the well immediately," Iraqi government spokesman Ali al-Dabbagh said in the statement. Senior Iraqi government sources initially referred to the Iranians as "security forces," but the official Iraqi government statement later called them an "armed group." Drilled in 1979, the well is in Iraq's Maysan province, east of Amara, near the Iranian border. It is within the province's Fakka oil field, the Iraqi government said. Al-Dabbagh said in the statement that the Iraqi government had summoned the Iranian ambassador in Baghdad, Hassan Kazemi Qomi, to inform him officially about the incident and asked him to provide a note to Iran's Foreign Affairs Ministry "to address such a violation." The statement said the Iraqi government called upon Iran "to resolve all border problems through diplomatic dialogue and avoid the use of military force in order to preserve our common security and bilateral relations between the two countries." An official at the Iranian Embassy in Baghdad had said earlier that Iraqi authorities had not yet contacted them. Iraq and Iran fought a bloody eight-year war that ended in 1988 in a cease-fire with no clear victor and parts of the border under dispute. But political, economic, cultural and religious ties between Iran, a predominantly Shiite Muslim nation, and Iraq, a majority Shiite Muslim nation, greatly improved after the overthrow of the Saddam Hussein regime in 2003. At the same time, there has been widespread concern among Iraqi and U.S. officials that Iran has been providing Iraqi insurgents with material for roadside bombs during the Iraq war. The report of the oil well incident comes several days after the Oil Ministry's two-day auction of oil fields. Aimed at increasing Iraqi oil production, deals were struck for seven of the 15 fields offered. There also had been oil bidding in June.